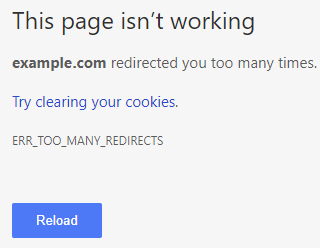 This will cause your site to redirect in a loop. There are a few other reasons your site could redirect. It's possible that a plugin you added to your site has cause the redirect. Try disabling your plugins to confirm if that is the cause. Your .htaccess file may have a redirect set up somewhere. Open the .htaccess file and view its contents. Look for anything redirecting your site to a different URL.